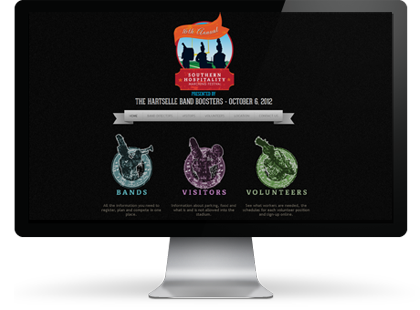 The Hartselle Band Family encompasses several different performance ensembles ranging from grades six to twelve. The motto of our band program is “Be a part of a winning tradition”. Hartselle Bands serve as a public relations tool which represents our school system and city where emphasis is placed on performance excellence. The Hartselle High School Symphonic Band performed the following at the 2016 Music Performance Assessment and for the fourth year in a row they have scored Band of Distinction Honors. We are so very proud of their hard work, commitment to excellence and continuing the Winning Tradition! To login in to your Charms account click here. Your name, the student's name, a valid email address and your relationship to the student. At the present time ONLY students in the High School Marching Band will be given access to Charms (includes 8th graders marching with the high school). HIS and HJHS students will be given access after school starts and we get their student information sheets back in. If you are not receiving our email notices please be sure and check your spam/junk folders. Congratulations to our Hartselle Junior High Band and Mr. Vaughn for their superior performance at State Music Performance Assessment. Congratulations to our All-State band members Dalton Kulick and Grace Friar. Very Proud of your outstanding accomplishment! Very Proud of the Hartselle Band's performance and all participants in the Veteran's Day Parade!!! Congratulations to a wonderful group of students who represented their school and community with excellence earning top scores of the day!